Arachnids are a large group of arthropods that as assigned to the taxonomic class Arachnida. Although typically thought of as insects, arachnids are anatomically different in some significant ways including the number of legs and body segments. There are 11 orders in the class of Arachnida.There are at least 65,000 to 73,000 species including the spiders, scorpions, ticks, and mites. Basic characteristics of Arachnida (Spiders, Ticks and Mites): (1) four pairs of legs as adults, (2) cephalotorax: combined head and thorax , (3) abdomen. No antenna, no wings. The Arachnids are distinguished by an anatomy that consists of a two body segments, which are called the thorax and an abdomen. They also have eight legs which set them apart from insects. They do not have any kind of wings or antennae, which further distinguishes them from others. The thorax contains the sense organs, mouthparts, and limbs in pairs. the first pair are the pincers or poisonous fangs; the second pair are the pincers, feelers, or legs; the other pairs are mainly for walking. The abdomen contains the genital opening and other structures. Arachnids posses an exoskeleton, which is a skeleton on the outside of the body. Arachnids reproduce sexually. They often give birth to live young but some types of Arachnids lay eggs. The female Arachnids may guard her eggs or young. Most Arachnids are free living and roaming creatures, but some ticks and mites are parasitic, and a few live on or near water. Most Arachnids only come together when it is time to mate, and when they are not mating they live solitary lives. 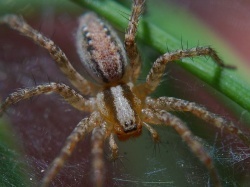 Many Arachnids are found in well protected habitats or niches. Most of them thrive in constent moisture containing microclimates provided by soil litter, burrows, or caves. In the dark you would have a great chance of seeing Arachnids because they make up a high proportion of the animals found in the dark or hidden environments. The Arachnids that live in desert areas stay hidden in their habitats to avoid getting too warm; they only come out when the weather is cool. This page was last modified on 20 January 2012, at 20:41.